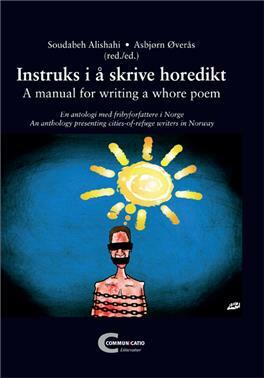 "A manual for writing a whore poem"
«A manual for writing a whore poem” is an anthology of texts and caricatures by ICORN guest writers living in Norway. The anthology is, as the title indicates, bilingual. For the third time, the Norwegian chapter of PEN International has initiated such an anthology, and for the second time it is being published in collaboration with the Communicatio publishing house. for translated literature at Aschehoug publishing house. Both editors are members of the board of Norwegian PEN. in a global context, than that ordinarily reflected by contemporary Norwegian writers, shaped as most of them are in a secure welfare society. The guest writers also represent other storytelling cultures, literary styles and language and rhetorical grips than what is traditionally used in Norwegian literature. In short they bring the world to Norwegian readers, and represent important contributions to the multicultural Norwegian contemporary literature.